Clearing the 60-vote threshold by two "yeas," the Senate tonight passed a $50.5 billion emergency aid package for superstorm Sandy relief and recovery, three months after the natural disaster ravaged coastal areas in much of the Northeast. The legislation now heads to President Obama's desk for his signature. Action on Sandy relief comes one month after the Senate voted to approve $60.4 billion in aid for Sandy victims, which became void when the House did not act on it before the end of the 112th Congress on Jan. 2. Since then, House Republicans in the new Congress okayed a new version of the package after hacking off all spending unrelated to disasters. Most of the money - $16 billion - will go to the Housing and Urban Development Department's community development block grants for rebuilding, primarily for victims of Sandy but also those affected by other federally declared disasters since 2011. Additionally, more than $11 billion is allocated for the Federal Emergency Management Agency's disaster relief fund to provide shelter and restore power and other utility services, and $10 billion will go to repairs and reinforcement of New York and New Jersey transit systems. During a press conference after the vote with his fellow senators from New York and New Jersey - the states in the center of the storm's brutal path - Sen. Chuck Schumer, D-N.Y., said while the bill passed didn't include everything Senate Democrats had wanted, it's "certainly close enough." Though he pointed out the unusual delay in relief for Sandy - "nine times as long as it took funds for Hurricane Katrina" - he nodded to the nine Republican senators who voted in favor of the bill, thanking Congress for coming together "in a bipartisan way" to finally get it done. "At long last - that sums it up," Schumer said. 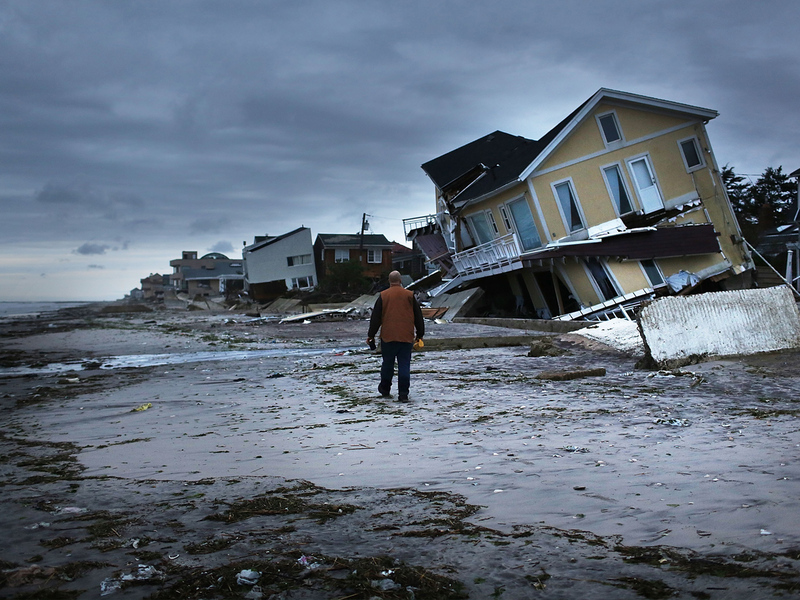 "Ninety-one days ago, Sandy struck a body blow against New York state and New Jersey. And today, we finally struck back." "...This country has had a tradition for over a hundred years: That when one region of the country is hit by a disaster, be it man-made or natural, the country stands together and helps them. It would have been an absolute disgrace for them to change the rules when New York and New Jersey were hit," he continued. "People from Maine to California will be helping people from Staten Island to Montauk rebuild, just as those in Breezy Point helped after earthquakes and tornados and wildfires." In a joint statement, Govs. Andrew Cuomo, D-N.Y.; Chris Christie, R-N.J.; and Dannel Malloy, D-Conn., thanked the Senate "for its thoughtful consideration and passage of the Hurricane Sandy disaster relief package. "Despite the difficult path in getting to this moment, the Senate membership clearly recognized early on the urgency and necessity of approving the full aid package and its importance in rebuilding our battered infrastructure and getting our millions of affected residents back on their feet as quickly as possible," they continued. "To all Americans, we are grateful for their willingness to come to our aid as we take on the monumental task of rebuilding and we pledge to do the same should our fellow citizens find themselves facing unexpected and harsh devastation." President Obama also released a statement after the vote, assuring that he will "sign this bill into law as soon as it hits my desk." He applauded "lawmakers from both parties who helped shepherd this important package through" but noted he had "hoped Congress would provide the aid sooner." "My administration remains committed to supporting our state and local partners and bringing every resource to bear as we help our neighbors rebuild. And we will continue to work closely with Governors and mayors to ensure this money is used appropriately," he said. "To date, we have already provided over $3 billion in aid to help recovery efforts, including hundreds of millions of dollars that have gone directly to families and businesses impacted by the storm. Brick by brick, block by block, our communities are being made whole again. And we will not rest until the job is done." Now, Schumer said, challenges remain, not only in the reconstruction process, but in administering the aid. "We will watch the bureaucracy like a hawk to make sure the money goes to whom it's supposed to go, and as quickly as possible," he said.